Open your Weave app and log in. Click on the Text to Pay icon from your app's Home Screen (if this icon does not appear, please contact customer support). Click “Create Account” on the modal window that appears. As you create your Stripe account, you will need to create your login credentials - 1) a username that will need to be an active email address that you have access to and 2) a custom secure password you create. Consider recording these as you will need them to login to your Stripe dashboard going forward. Because you are setting up a processing account, you will need the business Tax EIN, the business owner’s SSN, desired bank routing and account numbers, etc. Double check your bank routing and account information so that funds you receive will be distributed to the correct bank account. After you connect your Stripe account to Weave, you will be taken to your Weave Admin portal to brand your Payment Page (Admin portal > Left main navigation > Payments > Payment page). Once you get to the Stripe Onboarding Form, you will see text that says, “Already have a Stripe account? Sign in”. Click “Sign in”. To do this, you will need to set up separate Stripe accounts for each of your Locations. Open your Weave app and log into your Weave app as location #1. 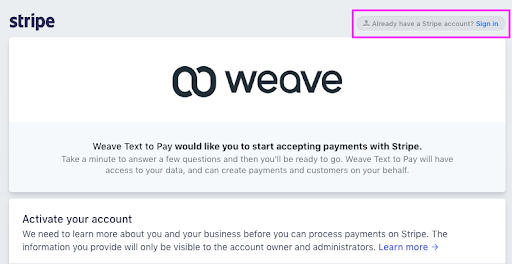 After you connect your Stripe account to Weave, you will be taken to your Weave Admin portal to Brand your Payment Page (Left Main Navigation > Payments > Payment Page). Once you have created your Stripe account for Location #1, continue to Part 2: Setting Up Additional Locations, below. 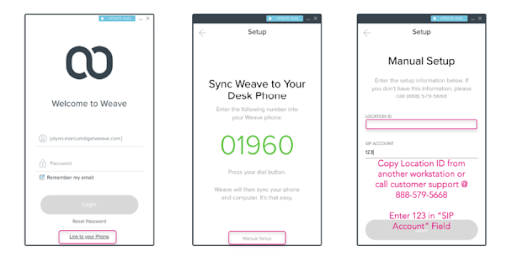 Click on the main app dropdown from your Weave app home screen. 3. Log into your app as the next location you want to set up. Select “Link to your phone” from the login screen. Enter your location ID provided to you by Weave’s Customer Support (888-579-5668) or your Onboarding Representative. You can also find your location ID by following these steps and copying your location ID from one of your other workstations that is synced with a phone. Enter “123” in the “SIP ACCOUNT” field and press “SAVE”. 4. Click on the Text to Pay icon from your app's home screen. 5. Click “Create Account” on the modal window that appears. 6. Fill out the Stripe account onboarding form for this location. As you create each Stripe account, you will need to create unique login credentials - 1) a username that will need to be an active email address that you have access to and 2) a custom secure password you create. Consider recording these for each location as you will need them to login to your Stripe dashboards going forward. 7. Brand your Payment Page in your Weave Admin portal for this location. 8. Repeat Part 2 for each additional location. This multi-location setup is not used as frequently primarily because having one stripe account for all of your locations may cause confusion as you are trying to track payments and do account reconciliation between locations. If you still want to set up Text to Pay this way, follow the directions below. Find and click on the Text to Pay icon from your app's Home Screen. 5. After you set up your Stripe account, you will be taken to your Weave admin portal to Brand Your Payment Page (Left Main Navigation > Payments > Payment Page). 6. Once you have onboarded Location #1 with Stripe, set up any additional locations with the instructions below in Step 2. Log out of your Weave app for the previous Location. Log back into your Weave app as the next Location you want to set up. 6. Login to the Stripe account using the credentials for the account you have already set up. This will connect this location’s Text to Pay feature to this Stripe account. 7. Log into your Weave Admin portal for this location. 8. Click on Payments (found in the left-side link menu). 9. Set up your Payment Page for this Location. 10. Continue to repeat Step 2 for each Additional Location.